Having babies is expensive business right! There’s the classes, the clothes, the furniture, the buggy (that may as well be a small second hand car at that price)! Are you approaching the end of your pregnancy and working out whether its worth the extra £30-60 for a TENS machine? Maybe it would help to understand a little more how they work and why they may help. TENS machines are a non-pharmacological method of pain relief, where 4 electrode pads are stuck to your lower back, which send mild, electrical pulses through the skin. If you try it during a normal day to day state it can feel completely bizarre! Like a tingling, buzzing or gentle prickling sensation, but during, but during labour, many women find it to be soothing and distracting from the sensations of contractions. Through a device that hangs around your neck, you yourself are in charge of increasing the intensity of electrical pulses, ‘boosting them’ and turning them off. TENS can be used in conjunction with any other forms of pain relief (except water.. for obvious reasons!! ), it can also be discontinued at any time, if you want to get into a pool for instance. Right.. so how on earth does sending electricity into your back help with pain? Well, firstly through something known as the ‘gate control’ theory. If you imagine all the way up your spine, there are lots of little gates that open to allow information through to reach your brain, and every sensation you feel below neck height, passes up your spine. If you are feeling contractions alone, the message your brain receives is a very specific one of discomfort. If you are able to confuse this message, by stimulating the surrounding nerve endings, it can diffuse the sensation that your brain in creating. Similarly to how we might rub a toddler’s knee if they fall over! 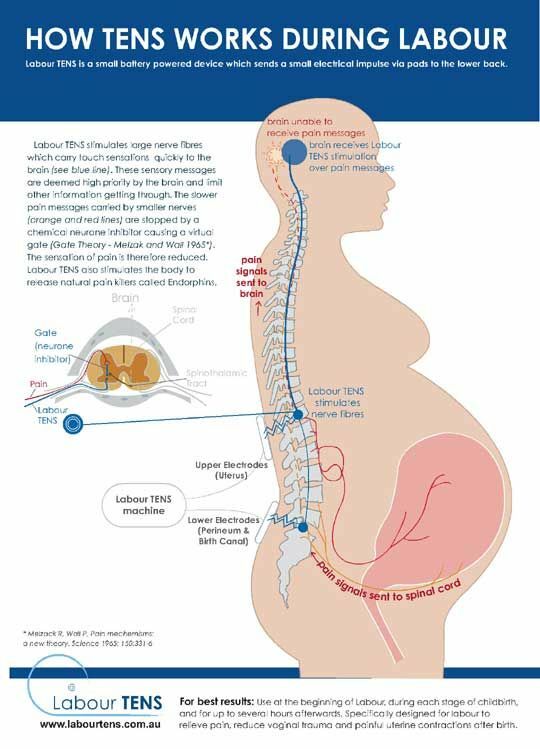 This is also why some women find having water poured down their back in the pool helpful during labour. Another way that a TENS machine might be helpful, when used on a high intensity, is through the production of endorphins. When our body detects pain, it creates it’s own pain killing hormones called endorphins- which, if you could bottle, are stronger than morphine! Therefore, the discomfort created by the TENS machine, increases the body’s own pain relieving hormones, which can contribute to making labour more comfortable. What does the research say? Currently, there’s not much high quality research into the use of TENS- since it’s almost impossible to ‘blind’ a control group- you would know whether or not you had one on! But most recent research shows that it can decrease pain levels during labour and increase maternal satisfaction around birth, there do not currently appear to be any negative side effects of using TENS during labour. So there’s certainly no harm in giving it a go! Did you use a TENS machine during labour? Did you find it helpful? Newer PostWhat are scans actually for? Older PostWhen will your baby ACTUALLY be born?